A Cornish police sergeant has paddled into the record books after completing his solo 4,500-mile voyage around the British Isles and Ireland. A crowd of supporters cheered as the traffic officer arrived back at the National Maritime Museum in Falmouth. He became the first person to paddle round the seaward side of every inhabited island that makes up Great Britain and Ireland in a sea kayak. 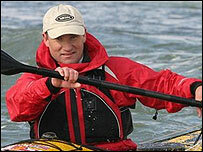 Sgt Morley, 39, from St Erth, has been paddling for nearly six months. He was flanked by local canoeists and an RNLI lifeboat as he paddled into Falmouth to be met by his wife, Linda, and scores of well-wishers, including a Cornish male voice choir. After joining in a rendition of the song 'Home from the sea', Sgt Morley said: "It's wonderful to be home. It has been a wonderful trip - in some ways I wouldn't want it to end, but it's good to be here." His said his lowest point came when he damaged his back in Ireland and feared he would not be able to complete his challenge. Sgt Morley spoke about the hospitality offered by the people he met along the way, joking: "If I had stopped with everybody who offered to put me up, I would still be out there." He said he hopes to publish a book about his epic journey, to be called Keep the Land On the Right. He will return to work on Friday, but is already planning further expeditions, including the first circumnavigation of the remote island of South Georgia in the Southern Ocean. Since leaving Cornwall on 3 April, the traffic officer has battled Force Eight gales, encountered whales and sharks, and met the self-styled "king" of an Irish island. His route has taken him around the Isles of Scilly, the Aran Islands and the Orkney Islands. The most northerly point of his voyage was Muckle Flugga, a small exposed island at the tip of the Shetland Isles. He had hoped to include the gruelling 65-mile crossing to the Channel Islands in his epic journey, but treacherous weather conditions made the attempt too dangerous. Fellow adventurer Pete Goss, who lives nearby in Devon, praised Sgt Morley's "amazing" achievement. He said: "I know from experience that it is quite a challenge to sail round Britain. "The weather and tidal conditions make it difficult for even the most experienced seafarer in a well-found yacht. "To think of Sean achieving this alone in a kayak around some of the remotest parts of the country is quite amazing. "The combination of physical, mental and emotional strain he has put himself through over the last six months is incredible." Sgt Morley's epic trip has raised money for the Royal National Lifeboat Institution and the Marine Conservation Society.